USB móttakarinn er mjög lítill og þarf þessvegna ekki að fjarlægja alltaf úr tölvunni. Tvær AA fylgja og endingin er ca 500klst. Quickly switch between HI and LO modes with the flick of a switch. In HI mode, G603 delivers peak performance with LIGHTSPEED 1ms report rate and up to 500 hours of non-stop gaming. When not gaming, simply switch to LO mode and extend battery life. LO mode reports at 8 ms for up to 18 months of use with 2 AA batteries. 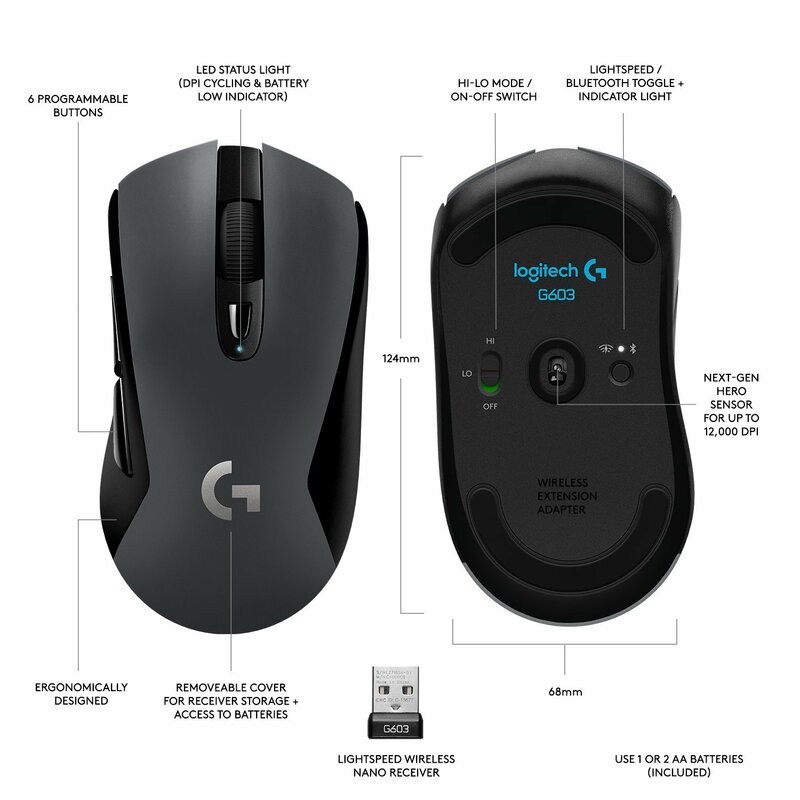 G603 wireless gaming mouse delivers up to 500 hours on 2 AA batteries—twice as long as our previous generation. Even with a single battery the G603 can last through up to 500 matches of League of Legends®. You can also choose which side to place a single battery with no impact to performance for custom balancing. When battery is at 15%, both LED status indicator and Logitech Gaming Software (LGS) will notify you before the critical moment. HERO is a revolutionary new optical sensor designed by Logitech G to deliver class-leading performance and up to 10 times the power efficiency (compared to previous gen). HERO sensor delivers exceptionally accurate and consistent performance with zero smoothing, filtering or acceleration from 200 to 12,000 DPI. Be the last gamer standing with G602 Wireless Gaming Mouse. Its naturally-shaped, slip-resistant grip is designed for maximum comfort over hours of use. DPI shift controls are in easy reach of your index finger. Easily identify the six individually sculpted side buttons by touch.